Ant Lab Games does a 2-player playthru. 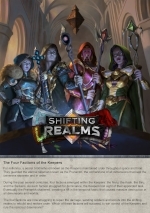 Check out TantrumHouse's preview of Shifting Realms. Full 2-player playthrough followed by a review. Enjoy! Kickstarter launches 10/25/2017. Link to follow. Katie, Melissa, Sara, and Ryan playthrough a game of Shifting Realms from Soaring Rhino's games.